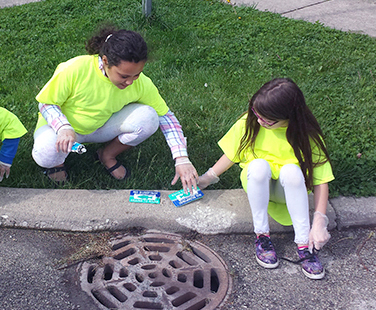 On May 7, more than 30 volunteers assisted Westmont Public Works staff with the labeling of storm drains throughout the community. Staff and volunteers identified and labeled 264 storm drains with educational information that alerts citizens to not put harmful materials into our storm sewers, which ultimately affects our water supply. This was a cooperative project that included the Westmont First Committee, Environmental Improvement Commission, Westmont Public Works Department, DuPage Conservation Foundation, SCARCE, and the DuPage Foundation. The educational medallions were part of the $15,000 grant that SCARCE received from the DuPage Foundation to provide funding for initiatives that improve water, soil, and air quality in DuPage County. Funds have supported a variety of initiatives including composting projects, pumpkin composting, no idling educational information, storm drain education, reducing mercury, and more. Downers Grove, Warrenville, Woodridge, and Westmont all participated in the storm drain education initiative receiving a total of 1450 medallions. The Village of Westmont thanks everyone involved with making this event a success.